When a child is diagnosed with a heart problem, it may be recommended that he or she have a test called a cardiac catheterization. This test or procedure will give the cardiologist information about the heart problem that cannot be learned from listening to the heart, looking at the electrocardiogram (EKG) or seen on the ultrasound (echocardiogram). 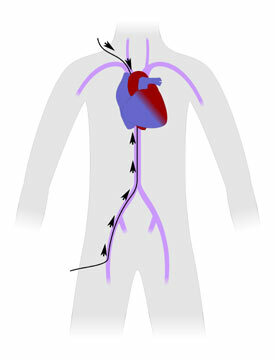 Often the heart catheterization information is used to plan for the surgery to treat the heart defect. Medicine is usually given before and during the procedure so the child does not hurt or remember the procedure. A local anesthetic (Xylocaine), is injected under the skin with a needle at the top of the leg (one side or both may be used). Once the area is numb, a needle is placed into the artery or the vein at the top of the leg. The needle is then replaced with a plastic tube, like an IV and called a sheath. The sheath lets the doctor put the catheters in safely and prevents the child from bleeding from the needle puncture. In some cases, the catheter site may also include the veins in the neck. A catheter is a hollow plastic tube about the size of a piece of thin spaghetti. It shows up on the special x-ray camera that is used in the catheterization lab. The doctor then guides the catheter through the big blood vessels to the heart and uses the catheter to collect small samples of blood and measure the blood pressures. These are used to calculate heart function. A special x-ray blocking dye is used to take the picture of the heart. The pictures are recorded and saved. Catheterization evaluates three major things: the amount of oxygen in the blood in each chamber of the heart, the blood pressure in each chamber of the heart and pictures are taken of the heart chambers. From these, the cardiologist can determine if heart surgery or other procedures need to be done.